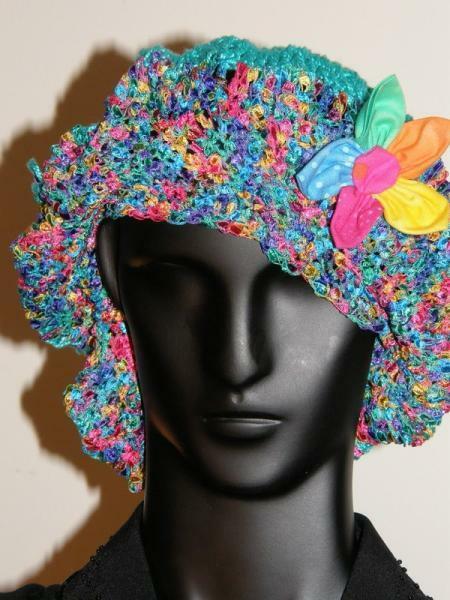 This hand crocheted Confetti Turquoise Fancy Ribbon Hat with a decorative fabric flower. Will keep your head warm and yet be fashionable on those cold wintery days. The ribbon yarn is quite soft and I used an extra small hook to ensure its thickness, for even one of Chicago's blizzards. The hat is made to fit most adults or young adults but not for small children. It has great stretch and plenty deep for comfort and warmth. 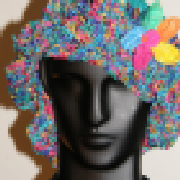 This hat can be custom made for you with the colors you specify. You can pick and choose the colors that will match your coat. The hat is approximately 20 Inches ( from start to end in the round circle ) and approximately 9 inches in height. Please note that the hat is stretchable in either direction. Just follow the check out instructions and when asked for the credit card, just fill in your information. I will adjust shipping when you purchase more than one item. Just send me a message and I will send you an invoice with the adjusted amount.